Overnight price action at the CBOT is seeing lows from last week pressured as the delivery for May approaches. Deliveries on May futures need to be posted by Thursday’s close, so folks with stored grain at elevators are faced with a decision whether or not to “price or roll”. Producers with cash flow needs and short nerves are throwing in the towel in mass with prices back near lows from September and December deliveries in wheat, and December and September deliveries in corn. Beans are lower as well, but this is not delivery pressure in my opinion. Beans face a mountain of production in the US 2017 growing year, along with competition from newly harvested South American product. 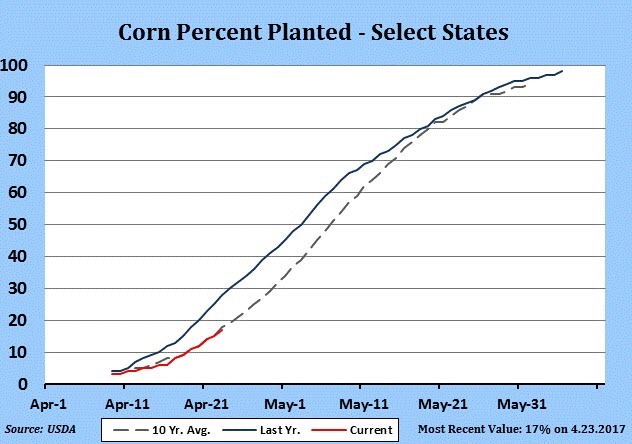 USDA crop planting progress showed 17% of the US corn crop with 6% of the US soybean crop in the ground. Both were close to the 5 year averages, but in corn, behind last year’s seeding pace of 28%. Minnesota and Iowa lag dramatically, but they can catch up quickly if the weather cooperates, which it should. The short term weather problems are affecting southern acres more than the areas lagging. US spring wheat seeding was 22% completed, well behind last year’s 40% and behind the 5 year average of 34%. 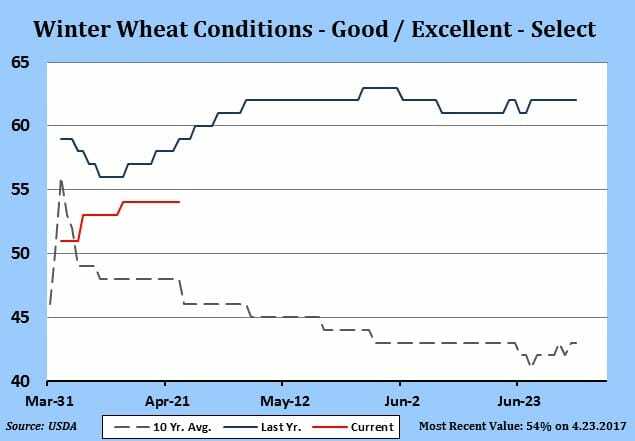 32% of the US winter wheat crop was heading with crop ratings unchanged with 54% of the crop rated GD/EX, slightly lower than a year ago. Cotton sowing is right on USDA pace with little problems seen at this point. Speaking of cotton, July cotton saw a technically negative outside day with highs from last week taken out and then the lows from Friday broken. Old crop fundamentals are solid here but I believe prices reflect it well. The outlook for higher US and World 2017 carry outs remains a bearish card you can not ignore. Remain hedged or look to establish new shorts on rallies back near 75 cents. For today, I expect more delivery pressure for wheat and corn, a move into the high 3’s for wheat should probably be expected. At this point my best advice would be to avoid things if looking at this stuff makes you become bearish in opinion. The moves have been made from where I see things, now is not the time to be bearish. I look for markets to turn around after the deliveries get settled out and the forecasts come into line. US weather forecasts are really wet in the 7 day period, with flooding possible in Arkansas, Kansas and Missouri. . The soil condition along with a cooler than average outlook temp wise is another negative. Its too early to start taking off yield or acres but the threat is greater than it was a few weeks ago, and will only rise into May. We also may see freeze in western wheat country. Lows could reach the upper 20’s to lower 30’s causing heads to become sterile. Bottom line, do not become too bearish down at these levels. Look at cheap volatility strategies in corn and wheat.